The blown-up Italian battleship ‘Leonardo da Vinci’. 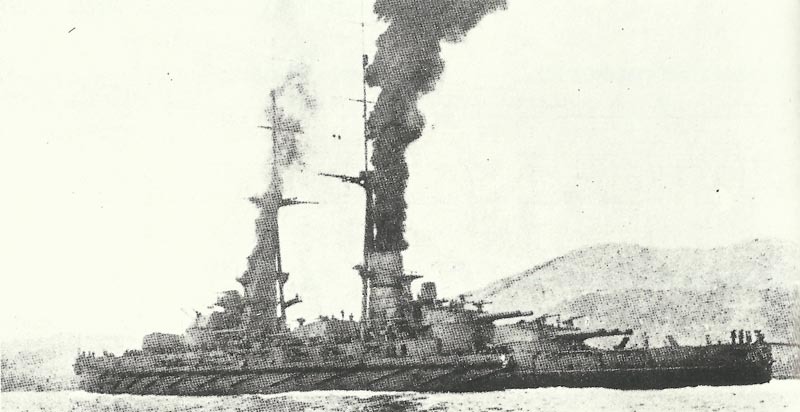 Mediterranean: Austrian saboteurs blow up and capsize Italian battleship Leonardo da Vinci in Taranto (248 dead). Italy makes no public announce­ment but 1917 raid in Zuerich on Austrian consulate proves sabotage. Adriatic: 4 Franco-Italian destroyers pursue 2 Austrian destroyers to within 15 miles of Cattaro and survive U4 ambush on return. Battle of the Somme: Very hot day (88°F). German attack on Delville Wood repelled. Verdun: French capture 2,550 PoWs and Fleury (until August 3), lose it and regain it on August 4. Germany: Hindenburg appointed to command whole front (he and Ludendorff visit Kovel and Lemberg on August 3, but Austrians then withdraw consent). Western Russia: German gas attack in Smorgoni area fails (and on August 22). Armenia – Turk Offensive (­until August 15): Kemal’s XVI Corps attacks 9,000 Russians at Mus and Bitlis. Britain: 6 Zeppelins raid East Anglia (night August 2-3, 1 civilian casualties) despite Vindex Bristol Scout attack (first carrier home defence operation). Somme: RFC helps range 19 batteries and finds 6 MG emplacements. Occupied Belgium: 6 BE2s and 3 Moranes (1 lost) in 5-hours long-­range attack on Brussels Zeppelin sheds (4 near misses); 16 RNAS aircraft strike St Denis Westrem airfield (southwest of Ghent) and RFC bomb Coutrai and Bapaume stations.